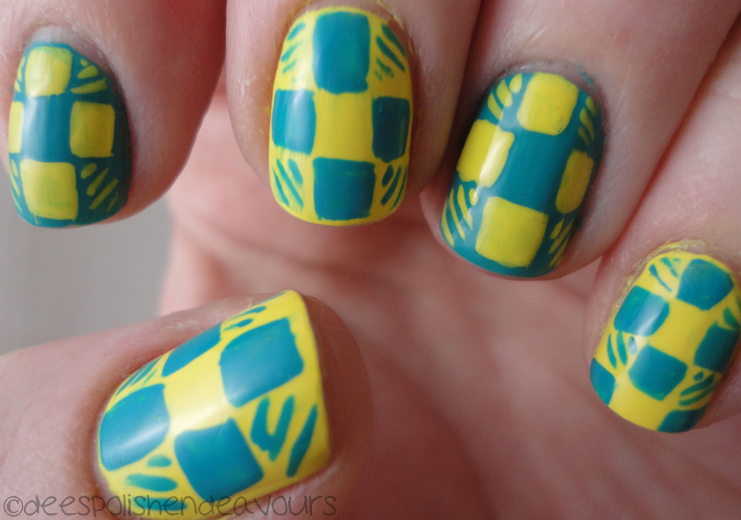 I stumbled across an image on this tumblr (it was on page 2 during my search) and I instantly saved the image and could not get it out of my mind.. Then I remembered I had some new Butter London (seriously, I feel like they should just create the polish line at my place.. so I can test them all out first.. That is how much I love them!) polish that I had my eyes on to use!! I used Butter London Cheeky Chops (yellow) and Slapper.. I have said this before, and I will say it again right now.. I freaking love Butter London nail polish. I know it is a bit on the pricey side, but seriously.. So worth it! The only one that I have that I am not in love with is 'No More Waity, Katie'. If you're thinking about getting one or five - please do yourself a favour and get it/them, you will love this brand. Ok, I will stop my fangirling there! You might have noticed that I clipped down my nails. They were all doing fine, no breaks or chips on EITHER hand, but I had a moment of, well, whatever, grabbed the clippers and nipped them down. There is just something about short nails that I love! I also got to do something fun on Friday evening before date night with my 'bff' - I got to do 3 sets of nails at a little get-together/going away party. So, 'S', if you're reading this - I hope you and your friends enjoyed your nails and that they survived through the weekend! I had fun doing the nails - and it was kind of crazy. I'm used to doing one set of nails.. But three? Insanity, but a good time none the less. 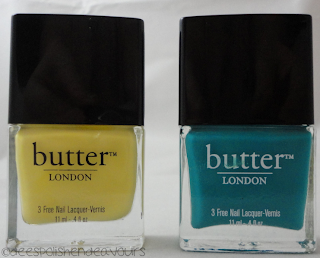 Ooh, and I had mentioned some untried Butter London polish.. Well, two of them are now tried, but anyways.. This is Lady Muck, Cheeky Chops, The Black Knight (I always want to write 'The Dark Knight' - curse you Batman!) and Slapper. I also recently "acquired" Branwen's Feather, but that will be coming up in a different post at a different time - how ominous! I hope everyone is having a terrific Tuesday - it is time for me to go and hit the books some more. Exam tomorrow. Yikes! love this so much! i'm definitely considering adding some more BL to my collex. I want rid of no more waity, katie though.. i hate it, lol.